Especialistas en viajes en autobús. Servicios a medida y alquiler de vehículos para cada tipo de desplazamiento. 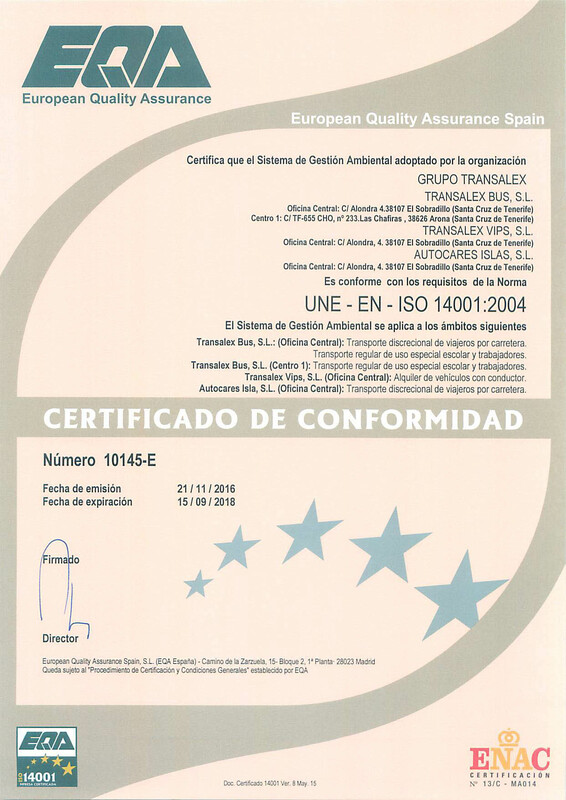 Tanto si viaja por negocios como por placer ésta es la mejor opción si busca la mejor calidad y servicio. How many people	(including children) ? Explore Tenerife in style and comfort! We offer an individual approach and are committed to advise personal and professional manner in order to rent the vehicle that best suits their tastes and needs. Our Bus Range is quite broad, which guarantees a wide range of services to meet the needs of our customers. We give the best response from the market in terms of quality of service, fulfilling the promise and taking care of the deal with the customer. Whether you are traveling for business or pleasure, this is the best option if you are looking for the best quality and service. 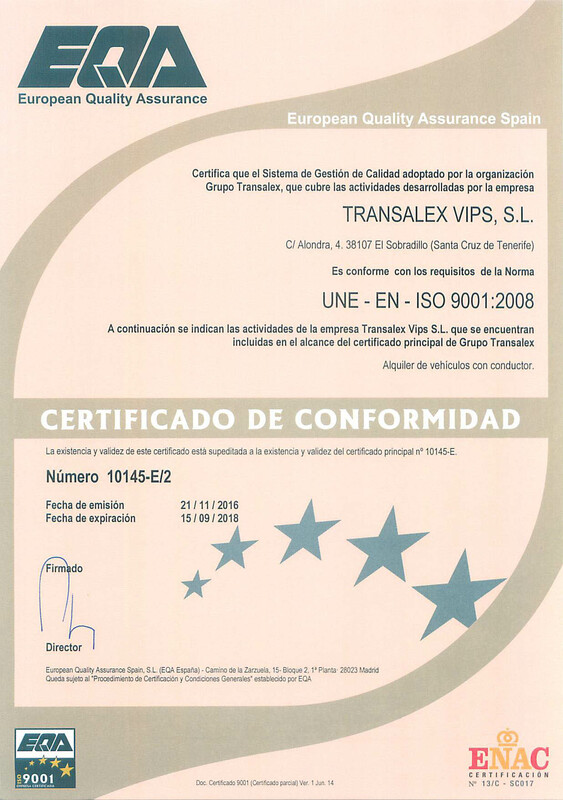 Transalex VIP is focused on those demanding clients who travel for business, small groups of clients or families that need personalized treatment. The drivers are chosen especially for this type of service. This type of product is also offered as rent with conduits for any type of event. Our services are the traditional hiring of Travel Agencies and Tour Operators, and we have a special coverage for all Incentives and Congresses of any kind that are held in Tenerife. Buses and Minibuses in Tenerife. Totally personal vip cars to travel comfortably. We have a large fleet of vehicles with capacities between 14 and 60 seats, which allow users to enjoy high levels of comfort and comfort, being equipped with all safety elements including belts and, complying satisfactorily with the current regulations in force of road safety. Inspections and Control. 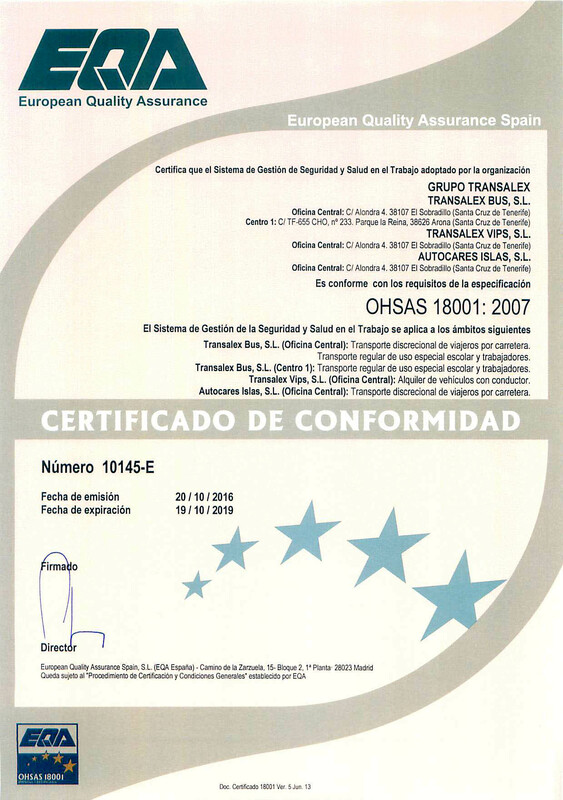 All our vehicles are periodically subjected to rigorous technical and administrative controls, in addition to complying with the technical inspections and other controls contemplated in the regulations that regulate our sector. Permits and Guarantees. We have all the permits and authorizations as well as the individual and collective insurance coverage required for the exercise of our activity. Why book your transfers with us? 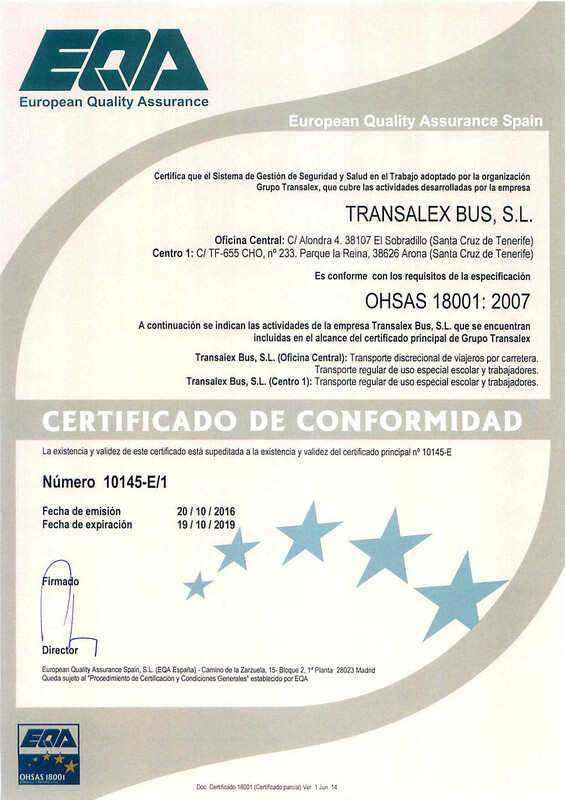 Transalex Bus is a dynamic company with extensive experience in the transport and road travelers sector. Our quality system covers the activities carried out daily by the company, consisting of adapted transport. Low prices and without sacrificing a great service. No debit charges or credit card payments apply. Booking online is easy and only takes 5 min. Changes and cancellations are free up to 48 h before the transfer. Our office has staff 24 hours a day, 365 days a year - we are always here to help you. 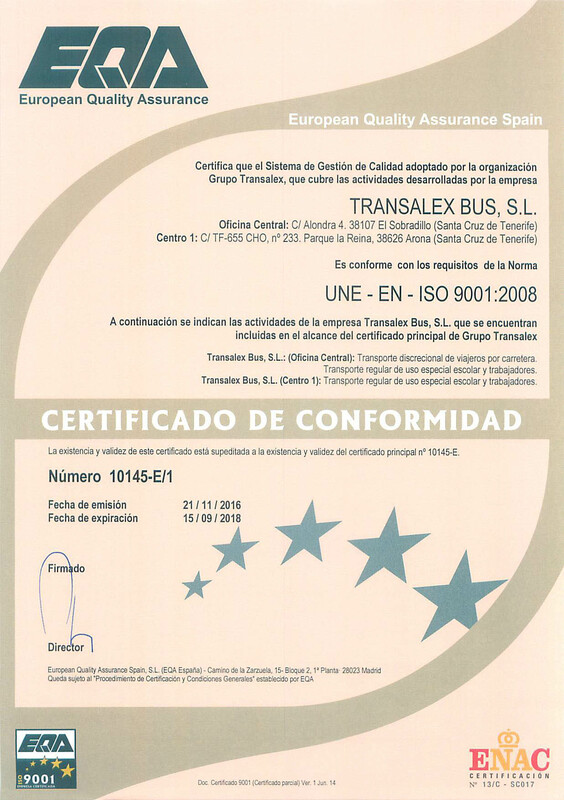 Transalex Bus is a company dedicated to the discretionary and special transport of travelers. In its modern facilities, with more than 3,000 square meters of offices and garage, we have everything necessary to offer you the best service. 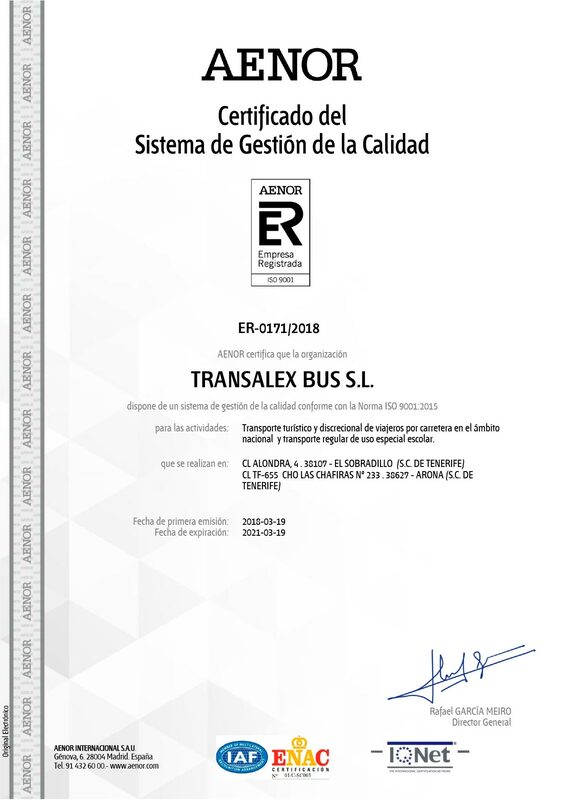 Transalex Bus has all the necessary vehicles for excursions, transfers, VIP clients, transfers, cars available, etc. Subscribe to our newsletter. Receive exclusive offers, discounts and promotions.